Spring 2014. This building, named The Alexandra, has been completed and open for about a year now. Rents have turned out to be much higher than expected when the rezoning was approved, as reported in our post of February, 2014: STIR program example: Affordable? $1820 for 1 bedroom rental apartment – 546 sq ft (The Alexandra, at Bidwell and Davie). There has been a fair amount of “flipping” of luxury condos in the building already, with units being listed at around $1,200 per square foot. Many lights are still off at night, suggesting that they were purchased speculatively or as investments, not for residents to live in. This project has been one example of projects approved under the STIR developer-incentive program, targeted by WEN’s lawsuit, which had its days in court on April 9 and 10, 2014. See Status update – WEN legal challenge on STIR and Rental 100 programs, May 9, 2014. Questions have still not been answered about the billion dollar mortgage written off by City Manager, for Millennium Developments, Olympic Village developer, which also developed this site at Bidwell and Davie. June 9, 2011. Demolition, Building Permit, and Construction are all pending. The site is boarded up. Police have been called numerous times to remove squatters due to failure of the owner to secure the site. We have heard rumors that a new owner has acquired this property. Henriquez Partners Architects appears to have a lien against the property. Our research suggests that assessed land value increased by several million dollars after this rezoning in December 2009. Owner has reportedly asked neighbouring building to approve a construction crane overhead. More research is needed. December 3, 2010. The Development permit for Maxine’s (renamed Alexandra) was recently approved. Millennium, the owner is in the midst of financial troubles over its Olympic Village property. Implications for this project are as yet uncertain. 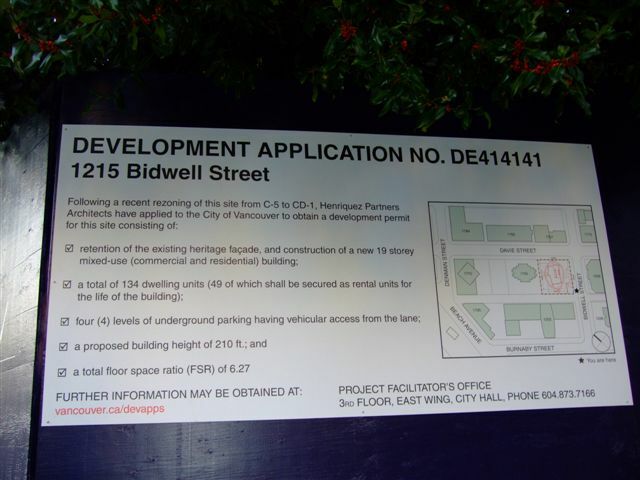 A Development Application sign went up September 13. The actual rezoning was approved by Council in December 2009, but this application was the next step. The official information is on the Development Permit Application. The project was on the agenda of the Urban Design Panel September 22. Agenda and minutes are here. (Last time before the panel was in 2008.) Citizens had the opportunity to comment on newest design of the tower by Henriquez Partners Architects by October 12th. City Council approved the rezoning to increase permitted density from 2.2 FSR to 6.27 FSR. The rezoning bylaw was enacted on July 20, 2010 and the site is now zoned CD-1. Millennium English Bay Properties requested a Development Permit in August to allow them to construct the proposed development. It has NOT been issued yet. Estimates show that Millennium (the developer) will make a profit of between 3% to 119% on this project. The NORMAL range of profit is 15 per cent to 20 per cent. This was approved unanimously by the seven Vision Councillors on City Council. City Staff have recommended City Council forgo $7.4 million in income (including $6.6 million from Millennium Development Corporation) that would have been spent on West End services and amenities. The City of Vancouver Planning Department is to review the application for Development Permit. The City of Vancouver Development Services Department needs to issue a demolition permit to allow Millennium English Bay Properties to demolish the majority of the Maxine’s Building and the remaining commercial buildings on the site. The City of Vancouver Development Services Department needs to issue a Building Permit to allow construction of the proposed mixed commercial, rental, condominium building. A funeral Wake was held for Maxine’s, as all business tenants had to close shop on July 31. For more information and some interesting videos capturing the colourful past of this heritage building, see Maxine’s Funeral Wake. Maxine’s at 1215 Bidwell Street is the first major project signalling the beginning of the City’s controversial Short Term Incentives for Rental Housing (STIR) program. It was approved by a bloc vote by Vision Vancouver on December 15 for rezoning to build a 21-storey condominium and rental tower. The Bylaw to support the rezoning was passed quietly on July 20, under the radar, with a 30-day appeal period. Businesses currently leasing space there from owner Millennium Developments were required to vacate by July 31. Citizens are still campaigning actively to save the building for its heritage value. You can get your Maxine’s t-shirts and buttons or participate in the auction of the painting by Tiko Kerr. This presentation about the Bidwell and Davie Street Heritage Property Rezoning and Comprehensive Redevelopment Request, December 10, 2009 provides an excellent overview of the issues related to the rezoning of this site. 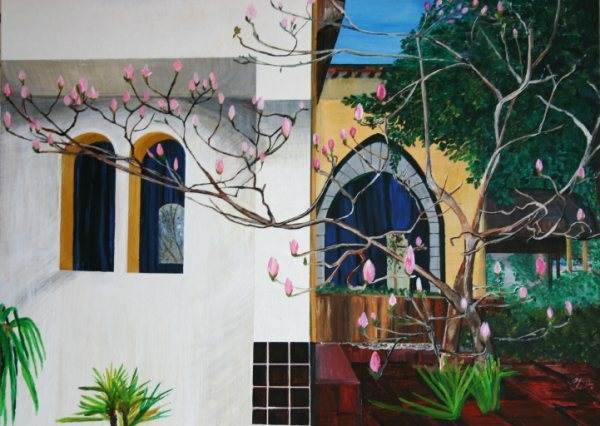 This painting of the “Magnolia tree at Bathazar’s” (now called Maxine’s) is posted compliments of the artist Elisabeth Littomericzky. You can find more about the artist and her work at Elisabeth Litto, art in Canada. August 5, 2010 Hoarding went up around the entire block at 1215 Bidwell (Maxines and other shops). Millennium and Henriquez appear to be trying to race ahead?The public has not been informed of plans. June 1, 2010 work started on Maxine’s, at 1215 Bidwell without a redevelopment permit or demolition permit. The awnings and signs were the first to go. Torn off and heaped in unsafe piles as rubbish adjacent to the sidewalks. The front of the character building, with a colourful history, was reduced to bare walls. Neighbours are saddened by the impending loss of Maxine’s. They also complained about loss of use of the sidewalk on July 1 and 2 and construction noise into the evening. David Autiero, City of Vancouver Project Facilitator for the Bidwell site (604.871.6265 david.autiero@vancouver.ca) advised that contractors are not allowed to block the sidewalk during these activities. They also cannot work after 8 pm. If they work do, he instructed residents to phone the police. He was informed contractors for Millennium Development Corporation are erecting a fence around the Bidwell site to keep squatters out. They are allowed to erect what he refers to as hording. After 2 days of work, it looks more like a wall to support the façade when the rest of the 105-year heritage building meets the wrecking ball or bulldozer. In response to neighbours concerns, the City will have the site inspected by building inspector Kien Wong (604-873-7598 kien.wong@vancouver.ca) and engineering inspector Dave Amy (604-873-7322 & 604-873-7423 dave.amy@vancouver.ca). Mr. Autiero also has a call in to the Heritage Department at City Hall. He will try to talk to the heritage architect to learn more about what should and should not be happening to the heritage building Maxine’s. From what neighbours have advised, it sounded to Mr. Autiero like the contractor has exceeded what is allowed without a development permit and demolition permit. An inspector will visit the site again on June 3 to learn more about what may be illegal activity. This is the same Millennium Development Corp. that created the City of Vancouver $60 million deficit this year, because Vancouver taxpayers bailed Millennium out of cost overruns on the Olympic Village. City Staff have recommended that City Council protect mountain views from the Olympic Village to increase the value of that Millennium Development Corporation property. This does not seem to apply to the West End. City Staff have recommended that City Council allow Millennium 2.8 times the density permitted on the Bidwell site and 3.5 times the height permitted (210 feet vs. 60 feet). This will permit Millennium to steal views from pedestrians, tourists, low-rise residential, etc. and resell them for profit. This will move higher income people into the West End and increase demand for expensive amenities that residents will be taxed to provide. Millennium and Henriques Partners Architects are supposed to in return provide benefits to the West End. But West End residents have already said in the City Staff summary of Open House Comments in the Oct. 20, 2009 Report to Council that the proposed so-called benefits do NOT justify the increased density and building height. Loss of a complete, functional heritage building (used as a viable business that communicates the history of the property) and retention of only a façade is NOT a benefit. It is a loss. It only benefits Millennium because City Staff are recommending a 54% increase in density over current zoning maximum FSR of 2.2 (increase building maximum size from 38,047 ft² by additional 20,612 ft² to 58,659 ft²) in return for demolishing heritage property (and retention of only the façade). West End taxpayers subsidizing Millennium Development Corporation by $6.6 million to build 49 unaffordable market rental apartments is a benefit to Millennium; NOT West End residents. City staff recommend increasing density an additional 185% above FSR of 2.2 (increase building maximum size from 38,047 ft² by an additional 49,785 ft², which when combined with heritage façade increase of 20,612 ft², increases building to 108,406 ft², which is 2.85 times current zoning maximum of 38,047 ft²) in return for the 49 rentals that West End taxpayers are contributing $7.4 million towards. Again a benefit to Millennium; Not the West End. Pedestrian, tourist and low-rise residential loss of openness and views to a 20-storey tower, so Millennium can resell these views for profit, is not a benefit to the West End. It is a benefit to Millennium. These are the stakeholders in this dialogue. Architect: Henriquez Partners Architects. This is a respected, Governor General’s Award-winning architectural firm hired by the site owners to see this project through from the rezoning application through design and construction. They obviously want to see this project go through. A review of their featured projects reveals no high-rise towers in a pre-existing neighborhood community, so perhaps this is a new learning experience. Same architect as in the 1401 Comox rezoning in the West End, for a 22-tower story which the public first learned about on Nov 3, 2009. City mayor and councilors: Elected to represent Vancouver citizens, these are the only people who hold the cards to the final vote in council, some time in the spring of 2010. Note that in the next civic election in 2011, the outcomes of this particular rezoning decision will be a factor voters consider in evaluating their performance and ability to listen to the community. The community: This includes immediate neighbors (depending on location, some will lose sunshine, scenic views of English Bay, Stanley Park, the mountains, and open sky), affected sub-groups in the different noise, vibration, dust and chemical exposure radius of demolition and construction traffic for a few years, local residents affected by increased traffic during construction and forever after, renters, resident owners of strata condominiums (represented by strata councils), absentee owners, large corporate owners, the entire West End community that will eventually feel the effects on their own blocks depending on the outcomes of this rezoning debate about 1401 Comox (the precedent set here may cause a domino effect that radically alters the landscape over the next five, ten, twenty, fifty years), the even larger community of all citizens and taxpayers of Vancouver who have a say in their city’s future, and also important, tourists, guests and visitors to the West End. The City of Vancouver undertake a complete review and reworking of the 1989 zoning regulations and other pertinent regulations governing the residential and commercial districts in the West End in consultation with community groups and organizations, property owners, interested West Enders and City staff. Henriquez Partners Architects have submitted a revised application to rezone this site from C-5 (Commercial) to CD-1 (Comprehensive Development). The rezoning would increase the permitted density from a maximum floor space ratio (FSR) of 2.20 FSR to 6.27 FSR. This increase would secure the provision of rental housing and the retention of the façade of the C-listed heritage building at 1215 Bidwell Street. The proposal is to construct a 210 ft. residential tower (maximum height permitted in the C-5 District) on a 4-storey podium base with retail/service uses at street level and 3 levels of rental housing above. Density was proposed at 5.67 FSR and is now 6.27 FSR, tower height is unchanged.